What better time to visit Universal Orlando as the theme park celebrates its 25th anniversary? There have already been special concerts and events throughout the year, but there’s still plenty of time in 2015 to visit Universal Orlando and enjoy the theme park as it toasts 25 years of awesome fun. There’s much to do during a visit to Universal Studios Orlando but all the fun hoopla surrounding the 25th anniversary is an added bonus to the overall spectacle of spending time at the park. For 25 years, Universal Orlando Resort has been creating epic vacations for the entire family. Fly above Hogwarts with Harry Potter, swing above the streets with Spider-Man, grab a Krusty Burger in Springfield, and join the ranks of the Minions and so much more. Universal Orlando’s two theme parks, Universal Studios Orlando and Universal’s Islands of Adventure, are home to some of the world’s most exciting and innovative attractions. There are magnificent on-site resort hotels, and a must-see entertainment complex with dining and entertainment for every member of the family. 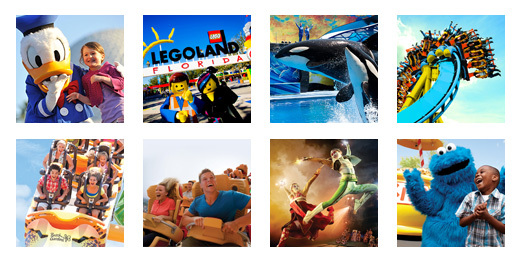 And with TicketsatWork.com you are going to save big bucks on your next Universal Orlando adventure. Halloween Horror Nights – On select nights in September, October and November, your worst nightmares will take shape as Universal Studios theme park is transformed into Halloween Horror Nights, the nation’s premier annual Halloween event. Grinchmas – Seuss Landing is transformed into a wintry wonderland complete with The Grinch and plenty of Whos. The Macy’s Holiday Parade – Giant floats direct from The Macy’s Thanksgiving Day Parade in New York City, plus marching bands, Santa and more! Amid all the festivities and good times surrounding the 25th anniversary celebration, Universal Orlando is already looking ahead to the next 25, starting with a new King Kong ride at Islands of Adventure opening next year. The Volcano Bay water park follows in 2017. A few months back a deal was announced that allows Universal to build attractions based on Nintendo games. Now that should be fun! There’s so much to enjoy at Universal Orlando—today, tomorrow, and for a long time coming. Let TicketsatWork.com jump-start your adventure with a great deal on tickets! Follow us on Twitter (@ticketsatwork) for 25 days of interesting Universal Orlando Facts!